Mosques across Egypt have witnessed the first Friday sermon on a set theme chosen by the government as part of newly introduced controls on Muslim places of worship. The policy is controversial in a country that is deeply polarised after the army overthrew President Mohammad Morsi last year after mass protests, amid deep resentment against his single year in power. Starting from Friday 31 January, all Egyptian mosques are to abide by the weekly topic posted on the ministry's website. The imams will not be sent written scripts. They may give impromptu speeches as long as they do not deviate from the official theme. Preachers at state mosques who disobey would face disciplinary action or sacking. Private mosques are threatened with annexation by the ministry if they do not toe the line. The theme for the first sermon was the importance of redeveloping squatter settlements and helping the poor. The following week's sermon, on 7 February, will centre on "the role of youths in society". It is hard to tell whether all mosques in the Arab world's most populous country have obeyed the new instructions. It is also too early and rather difficult to assess whether the ministry will be able to enforce the decision on tens of thousands of mosques nationwide with only a limited number of inspectors. Other newly introduced state controls over mosques include restricting the weekly sermon to clerics appointed by the authorities - who must be graduates of al-Azhar University [one of the main centres of Sunni Muslim learning]. Thousands of unlicensed prayer rooms in apartment buildings across the country are to be closed. Supporters of the state guidance consider it necessary to stop preachers from stirring political tension. They argue that the job of the imam or preacher should be confined to spiritual matters and social problems, and steer clear of politics. "Muslim Brotherhood preachers have used the pulpits to spread their political opinions and incite violence against the army and security forces," said Ahmed Abdel Mohsen, a 37-year-old lawyer. Bombings and drive-by shootings targeting police officers have increased as retaliation for the killings and jailing of Brotherhood members and other Islamists. Several attacks have been claimed by an al-Qaeda-inspired militant group, but the government accuses Mr Morsi's Brotherhood of orchestrating the violence and has branded it a terrorist group - an accusation the Brotherhood categorically denies. "These Muslim Brotherhood preachers exploit naive people and brainwash them into believing that what happened [last July] was a coup and not a revolution. 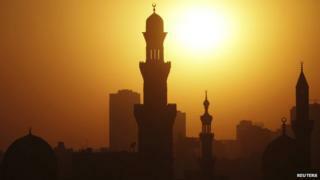 "Religion and politics do not mix," added Mr Abdel Mohsen, who spoke to the BBC from the capital Cairo. For him and those who share his views, the country badly needs stability after three years of political upheaval since the toppling of Hosni Mubarak in 2011 following an uprising against his 30 years in power. "The Muslim Brotherhood harbours great grudges towards Abdel Fattah al-Sisi and uses mosques to pit the people against the popular strongman, who is the only one capable of bring calm and stability," said Mr Abdel Mohsen. He was referring to Gen Sisi, the head of the army, who is widely expected to run in the upcoming presidential elections. Many Egyptians credit him with toppling Mr Morsi. Rights activists have accused the Egyptian authorities of imposing heavy restrictions on freedom of speech after the overthrow of Mr Morsi. They say the military-backed interim government wants to silence forms of dissent through banning popular programmes, arresting journalists and removing some online videos critical of Mr Sisi. Hisham Hanafi, a 31-year-old accountant, says the weekly Friday sermon has a huge amount of influence on people in Egypt. He thinks that many people in the country could be easily manipulated through religious discourse, due to high rates of illiteracy. "The imam is the first person they go to when they want to know what's right and wrong. "One Friday sermon has an impact far bigger than media personalities and the torrent of talk shows," he noted. For Mr Hanafi, the set sermon themes mark a return to the Mubarak era of state control and scrutiny over mosques. "The clock has already turned back to the days before 2011 when the state security agencies were dictating the terms and conditions on the imams to protect the regime against mounting public anger. "And the ongoing crackdown on free speech is an emphatic case in point," he said.